nam wrote: I read in Lt Gen. Husian article that RR battalions are bigger than regular battalion. 1000 men. Regular infantry battalions have 4 rifle companies, in case of the RR they have 6 rifle companies. Go Cpt Rajeev Joshi was my house captain once upon a time! With Russia under sanctions, where would the engines for the Ka226 come from? The issue is not fold vs. not fold. It was auto fold vs. manual fold. Auto fold = weight penalty due to additional mechanism required. 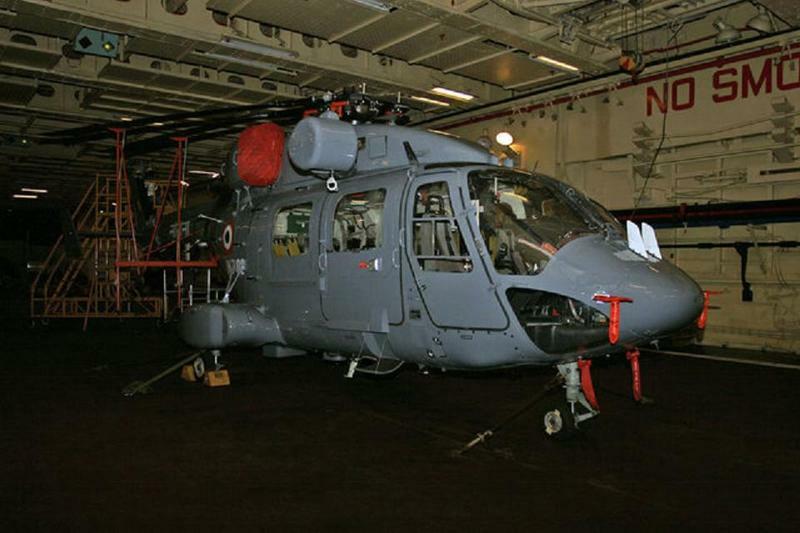 Here is a Naval SAR Dhruv embarked in Viraat's hanger.....with blades folded. The idea for these shallow water ASW ships came from a visit to Turkey by then CNS Nirmal Verma. The Turks were using commercially available fishing sonars fitted onto inshore craft for harbour defence. The idea therefore was to have something cheap and effective. 99.9 percent of accidents and leaks in N-plants are on the non nuclear side, most often due to corrosion in piping. Thanks for your clear explanation of the Indian nuclear submarine design philosophy. I don't know if LR-SAMs are loaded, but all the hardware and software allowing "plug and play" is there already. This was not the case with the 16A when commissioned. The LR-SAM I understand has been qualified and that the Alpha's are already equipped for it. The system you are thinking of is called the WM-18. This L&T launcher is carried on the Shardul Class LST. Since the engine pack is rear mounted and the gun is fixed, mounting the gun rear facing reduces the footprint of the entire system. This makes for easier storage and transportation. It is therefore the lowest cost (time and money) conversion! Many thanks for the exhaustive info. The person responsible for conceptualizing these ASW vessels was very clear that these are meant as low cost vessels inspired by Turkish Tuzla Class, which are equipped with depth charges and fisheries sonars for harbour defence. So no missiles. Tsarkar has already provided further details. The other interesting issue is that of integration of 105mm guns with the BMP. I recall seeing a prototype at DEFExPO some years ago..is there a production order for these? The Metamorphosis upgrade has the same basic restriction as the M46 design, namely restricted angle of elevation. This limits crest clearance when deployed in mountain areas. Plus, the basic design is now quite dated and we have access to the FH77 blueprints. Guys for the last time the P-28 was not designed to embark SSM. Ditto for the NOPV. Given their role, there is no need for SSM. This makes them cheaper to build and operate. It looks like some kind of decoy being fired. Great to see you on the board. Perhaps an offline discussion would be more suitable on the subject. More than one friend with direct experience has described at the ITBP as "unprofessional" and "cowardly".